"Brush" and "Smudge" are brothers. Their mother was a barn cat and they were living in a bucket behind the milking barn of a local farm near where I lived. I was "convinced" to adopt the 10 week old kittens as winter approached because their mother would not keep them in the barn. 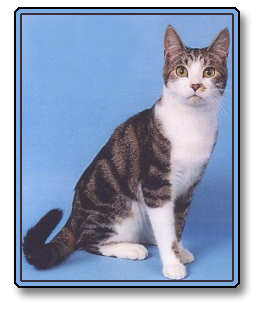 They were both handsome brown classic tabby and white, short haired kitties... and they stole my heart. My vet told me about showing in the Household Pet division of TICA. She said I should try it since she thought both of my cats were as beautiful as I did. So my "boys" and I tiptoed off to our fist show in March 2002... and they did very well indeed. We were hooked. By November, I had brought champagne and a cake with Brush's picture on it in honor of his newly-earned Supreme Grand Champion title and was ready to celebrate with all my new cat friends at the Westchester show in New York. What should have been one of the best weekends of my life turned out to be the worst. Showing two cats in the same class required some help, so my friend, Vicki, was carrying Brush up to the ring while I had his brother Smudge. All was going well until on the last day of the show. While on our way to a ring, something spooked Brush. I heard Vicki call my name. When I turned around I saw Brush trying to jump from her arms. I gave her Smudge and took Brush from her, trying to hang on. He was absolutely panicked and was struggling like I had never seen before. I started to lose my grip on and he was slipping towards the floor. We both ended up on the floor trying to hang on. Looking back, it probably looked like some kind of Abbott & Costello routine. At the time it was sheer panic. I finally lost hold and he was running in fear. I was upset but still thinking it would be okay... it's not that unusual for cats to get loose in show halls, after all. He ran through a judging ring, under the dividing curtain and turned and ran along the wall towards the rear of the building. Near the rear corner of the hall there was a door that had been left open because of a bent hinge which did not allow it to be shut. The open door allowed Brush out into a hallway that led to doors that went to the rear parking lot. A door, which also should have been closed, was open with two men standing there smoking. Brush ran by the two gentleman and into the parking lot. When I got to the door Brush was already out of sight. No one had any no idea which way he had gone. If you hear a call of "Cat Loose", don't rely on someone else closing the door. Every person should make it their responsibility to check and make sure all doors are closed. Many exhibitors helped me search for Brush that day... but Brush was gone. I was heartbroken. I took the photo of Brush I used for his grand cake and an exhibitor ran to Staples to have color copies made into flyers to hand out to the shelters and others from the area before they left the show. I stayed over Sunday night hoping that I would find Brush the next day. On Monday I was joined by my friend, Carolyn, who drove back to the showhall to help me look and lend moral support for which I will always be so grateful. Eventually she would make many trips back to the Center to put up more flyers, talk to the staff and search the area. A mother who lived nearby and had been attending her first cat show on Sunday returned on Monday to help again. She continued to drive through the area looking for Brush again and again. This from a woman who I had never met! But still there was no sign of Bush. Reluctantly I had to leave on Monday afternoon Needless to say I was devastated. I decided I was going to return every other week as long as I could. I would not give up hope. In the meantime I was contacted by a gentleman named Chuck, from LostPetAlert.com, a website that posts photos and info on lost pets. He traveled down from the Hudson Valley area numerous times to search for Brush and put up more flyers. He used his website and offered his toll free number to help. During the next two weeks, there was not one sighting of Brush by any of the locals or the others who were driving down to continue the search. The temperatures dipped below freezing. Then eight inches of snow fell. Friday I drove the 400 miles back to the show hall to search again for Brush. I was hoping that I would find tracks in the new-fallen snow that might lead me to him. I walked around the rear of the Center to where Brush had first got out. There were cat tracks near the storage building and dumpster! The tracks ran from a rubble pile near the dumpster into some leaf piles and down to a small stream and then back around. There wasn't any particular area that appeared to be a hiding place. I walked around shaking a dish with food in it, calling his name. There was no response. Don't give up hope because your cat has not been seen. This is not unusual. Cats are secretive. People started arriving at the Center around 6 am to set up for that weekend's show so I left to search a small residential area to the rear of the Center. There I met Chuck from LostPetAlert.com. He helped me search the area using a thermal scanner but with no luck. He told me to keep looking. Not to give up. Perseverance was the key. I met Carolyn that afternoon. After talking to the staff at the Center again we searched the basement where there were two broken windows thinking Brush might have gone in there searching for heat. No luck. Returning to the rear of the Center again, Carolyn set a trap near the dumpster. Before she left she told me she thought Brush had stayed in that area since there was food that fell from broken trash bags around the dumpster that he could eat. She told me to have faith and she knew I would get Brush back. Later that night I returned to the dumpster hoping to see Brush in the trap. It was empty. Sitting in my car I was near tears. I was talking on my cell phone bringing a friend up to date on the search when I sensed movement out of the corner of my eye. I saw a cat duck under the dumpster! There was a flash of white on the cat's hip. It was Brush! I threw down the phone and ran to the dumpster calling his name. He did not come out but I could here his repeated crying meows. I ran back to the car, grabbed the dish of food and sprinted to the front of the dumpster. Laying on the ground, I called to Brush while rattling the food in the dish. I could hear his cries getting closer and finally his little face peaked out from underneath the dumpster. He stared at me for what seemed like a lifetime while I held my breath. Then he lunged out and shoved his face in the food dish. I grabbed him! Laughing and crying at the same time I hugged him while he snuggled under my chin purring. I could not believe how skinny he was! I gently put him in his crate in the car with his food dish and went looking for a motel that accepted pets. That was the best night in a motel I ever had! We arrived home Sunday afternoon, tired but so, so happy :-). When it first escapes it is frightened and in some sense knows it has done something wrong. It often will not answer to its owner's voice at that time. It is more likely to come out of hiding at a quiet time of the day. Brush survived his ordeal a little worse for wear. His homecoming celebration began with a good kitty bath. You can imagine what he smelled like after living under a dumpster :-)! A trip to our vet resulted in a rabies booster and he was given antibiotics for two bite marks and some cuts and scrapes on his nose & upper lip. The points on his canine teeth on his left side are broken off, both upper and lower. The vet thought he took a fall and hit his face. Other than these minor injuries he was in fairly good shape although he had lost a lot of weight. Trevor Ransdell for crawling under cars in the parking lot looking for Brush. Kathy Keeley for making flyers at Staples. Photographer James Child who gave me carte blanche to use his photos for posters, flyers and websites to look for Brush. Debra Galliard and her daughter, Brooke, who helped look the day of the show, came back on Monday to help and took flyers to the local police station. She continued to drive through the area looking for Brush and kept me updated on the condition of the flyers we had posted. Vandy Veeder, Linda Downey, Jon & Cathy Gargill, Lorraine Greenwood, Donna Gonya and many others who I can not remember or had not even met were out searching for Brush the day he escaped. Francine Hicks, who was judging at the show, was unable to help search but helped communicate with others and printed up more flyers for me. The one person that deserves some sort of award for her help and support is Carolyn Wisz. She not only was helping to look for Brush on Sunday, drove back down on Monday and made many trips to White Plains from her home on Long Island to put up more flyers, talk to the staff at the Center and search the area for Brush. She supported me through everything and helped keep me sane. I do not know what I would have done if not for her moral support.